Alongside the Realme 2 Pro, Realme has launched an entry-level smartphone, namely, the Realme C1. The Realme C1 is the cheapest smartphone with Snapdragon 450 chipset in the country right now, taking the crown from Xiaomi Redmi 5. At Rs 6,999, the Realme C1 offers a notched display, dual rear cameras and a 4230mAh battery. The Realme C1 is basically the Realme 2 with changes to the design and downgraded RAM & internal storage. The C1 rocks a 5MP shooter on the front, which is another change we spotted between both the phones. The Realme 2 also competes with the Honor 7S smartphone which was launched a few days back in India at Rs 6,999. Also, it goes against the Xiaomi Redmi 6A smartphone too. 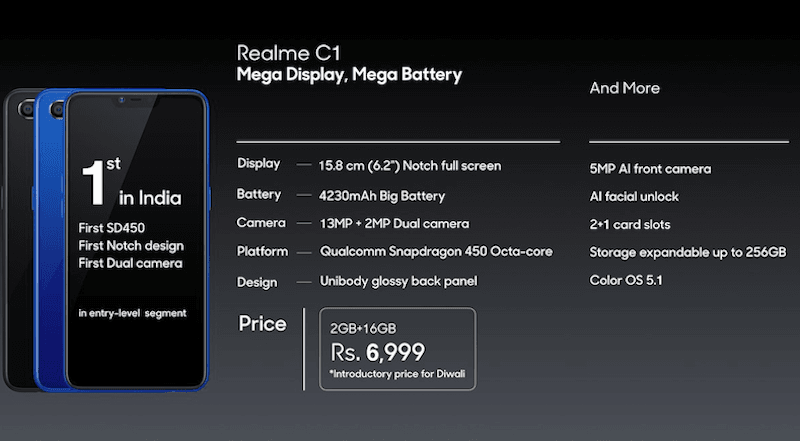 The spec-sheet of the Realme C1 is way better than any other smartphone available at the price of Rs 6,999. The phone has a 6.2-inch HD+ display on the front with a notch on top and 19:9 aspect ratio. Under the hood, it has the Qualcomm Snapdragon 450 chipset, clubbed with 2GB of RAM and 16GB of internal storage. Realme has added a dedicated microSD card slot for storage expansion up to 256GB. The Realme C1 lacks a physical fingerprint scanner and one has to rely on the Face Unlock functionality. The best part with the Realme C1 is the company did not cut any corners to reduce the price of the phone. The handset rocks dual cameras of 13MP+2MP on the rear side, along with a 5MP front-facing camera. As always, the camera app comes loaded with a lot of Artificial Intelligence features such as Beautify, bokeh mode for front camera and so on. As for the connectivity options, the Realme C1 has Dual 4G, VoLTE, Wi-Fi 802.11 b/g/n, Bluetooth 4.2, GPS and Micro USB port. As for the software, the phone runs on Android 8.1 Oreo-based ColorOS 5.1, which offers various customisations and also a skinned interface. Lastly, the phone is backed by a 4230mAh battery but it lacks fast charging support. This is where things get super interesting. For the asking price of Rs 6,999, the Realme C1 has a steller spec-sheet which is enough to beat the Redmi 5. The Realme C1 will be available exclusively on Flipkart starting October 11 at 12 PM. The Realme 2 and Realme C1 are very identical on paper. Observing closely, the design of the Realme C1 doesn’t have any Diamond pattern back and it also lacks a fingerprint scanner. The Realme 2 comes in two variants with 3GB of RAM and 32GB of internal storage and the other variant with 4GB of RAM and 64GB of internal storage. The Realme C1 comes in a single variant with 2GB of RAM and 16GB of onboard storage. Which one will you pick between the Realme 1 and Realme C2? I want to know it supports dual VoLTE dual standby.? ?